Are you an outdoor enthusiast looking to boost up your hiking skills? Then thru-hiking may be the next step for you! Thru-hiking – pronounced “through-hiking” – is a form of long-distance trail hiking which takes place during multiple seasons and without any long-drawn-out breaks between sections. This method of hiking is the direct opposite of Section hiking which refers to the technique of hiking one trail section at a time, without persistence or continuity and not in sequence within a full hiking season. Thru-hiking is a thrilling outdoor activity that is popular in the United States, New Zealand, and Australia. However, in the U.S. thru-hiking is commonly associated with terms like the PCT (Pacific Crest Trail), CDT (Continental Divide Trail), and the Appalachian Trail (AT). It also alludes to very long end-to-end hikes. The origin of thru-hiking dates back several years when long-distance travel was an effective means of transportation. It was later merged with conventional hiking and became a hobby that many people around the world were practicing. One of the most popular thru-hiking stories features a young, Russian immigrant who was not more than 27 years old, known as Lillian Alling. It was said that this young woman became homesick and made up her mind to go back to her family in Russia. But she was not financially capable of taking conventional means of transportation. But Lillian was a determined individual who wouldn’t let the lack of funds deter her from her firm resolve. She decided to walk the entire 12,000 miles to Russia, moving across Canada and right into Alaska. The last time she was seen was at the Bering Strait preparing to cross over by boat to Siberia. George W. Outerbridge is one of the notable thru-hikers who completed the first section hike of the Appalachian Trail back in 1993. It was a newly-completed project back then and got a lot of people very eager to hit tackle the notorious AT. Before then, however, another thru-hiker named Earl Shaffer was the first individual to have publicly thru-hiked the Appalachian Trail as far back as 1948. A report surfaced in 1994 which claimed that a small group of boy scouts had achieved this feat about 12 years before then, but there is no proper documentation to back this claim. Thru-hiking a trail is an extremely long journey that is fraught with a lot of difficulties. For instance, an Appalachian Trail thru-hike can take up to five months on average. The thru-hiker will have covered about 2,189.2 miles. Thru-hiking the CDT (Continental Divide Trail) or PCT (Pacific Crest Trail) also take up to 4 to 6 months to complete. Preparation can take more than a few months in order to purchase essential gear and to confirm re-supply points along the trails. Some dedicated thru-hikers usually complete a trail more than once. Long-distance hikers who have completed all the three longest National Scenic Trails – i.e., The Pacific Crest Rail, The Appalachian Trail, and the Continental Divide Trail – are known as Triple Crowners. Thru-hikers are known to arrange supplies for the trip far in advance. They usually arrange with some friends or members of their families to mail packages to prearranged stops that are peppered along the way. These packages are generally picked up as general delivery. The most popular method employed by most thru-hikers is to re-supply approximately every 3 to 5 days at a town or village that is not too far away from the trail. This offers a better degree of flexibility and minimizes unnecessary planning which could take up too much time. 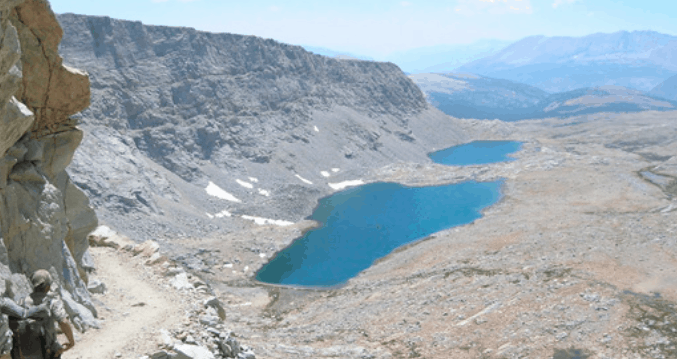 The Continental Divide Trail (CDT) doesn’t have one authorized route. Approximately 76 percent of the trail has been completed as stated by the CDT Coalition. Many people, however, choose to section-hike instead of thru-hike trails as a result of a lack of desire or time constraints. These people utilize section-hike trails and complete them the full trail piece by piece over several years. Thru-hiking is fast becoming a minor industry, no thanks to the rise of backpacking in the U.S. The Appalachian Trail Conservatory, on the other hand, defines thru-hiking as one that is completed within a period of twelve months. But then, this does not imply that the hiker traversed the trail from start to finish; it only means that the hiker has devoted enough time to complete the trail from end-to-end before taking up everyday life again. There are two significant forms of thru-hiking; supported and unsupported thru-hiking. The former involves a team – i.e., a hiker and another individual, often a spouse or friend – who carries the most essential gear and always meets the hiker at the end of the day. Unsupported thru-hiking involves the hiker alone, and he or she takes everything they need and restock along the way. There are lots of thru-hiking blogs on the internet today each one bearing one form of information or the other. However, this write-up highlights the top 25 best thru-hiking blogs today. Each blog is dedicated to thru-hiking and bears a lot of information about the outdoor activity. Without wasting too much time, let’s dive in! Tick Tock is a blog that talks about the cold mud of the Appalachian Trail (AT), the lukewarm coffee, the rain, etc. in such descriptive and colorful narrations that you will want to join the thru-hiking community immediately. As the author hikes north – across fourteen east coast states, she makes her readers crave that type of lifestyle. Her blog is rife with posts about rivers and swamps, rain and mud, along with the kind of people she encounters from day to day on her hiking trips. Tick Tock also makes playlists from time to time. Notachance is someone that really takes thru-hiking seriously. She recently completed a thru-hike of The Ararora which is a long-distance trail located in New Zealand. She has thru-hiked the Pacific Crest Trail (PCT) three times. Notachance – whose blog named “Dirtbag Drama,” where she highlights her entire thru-hiking trips – is filled with stories of her tenacity at conquering thru-hiking trails. If you are a little bit sensitive, you may not like the swearing and boozing, but there are more than enough jokes to go round. The stories are also devoid of untruthfulness but full of open honesty. She is presently about 800 miles across rivers, canyons, and wilds of New Mexico and Arizona, on the less popular Grand Enchantment Trail. You should not be taken in by her overly conversational tone; she has a sharp, beautiful, and enjoyable language that you will love and adore. The three most magnificent hiking trails in the United States – known as the Triple Crown – has virtually become the playground of Helen. You can follow her backcountry Pacific Crest Trail (PCT) blog where she details her hikes from the Mexican border to Canada. She goes from there through California, Oregon, and Washington. Helen has a simple writing style that is easy to follow and shares lots of pictures of the snow-lick mountains of the west coast. She also writes about the long water-carries, the desert’s grit, and the magnetism of eucalyptus. She also writes about the people she meets on her journey and points out the fact that each person out there in the desert is searching for something. Katherine is another interesting lady that hiked the Hayduke Trail across the mythic and rocky Colorado plateau. The plateau crosses two states – Arizona and Utah – and six national parks. The trail also cuts through red rocks (that bear striking resemblance with muscle tissue), washes, sculpted canyons, and sand. Katherine’s lifestyle is surreal, just as the images she shares on her blog. She writes magically about the cold and warm. Dixie – real names Jessica Mills – a thru-hiker to the bone. She thru-hiked the Appalachian Trail back in March 2015 and ended in October the same year when she reached the summit of Mount Katahdin. She has also thru-hiked the Pacific Crest Trail and decided to do the same on the Continental Divide Trail this year. She loves the outdoors and writes about nature, gardening, and even catching lightning bugs. Erik the Black – real names Erik Asorson – thru-hiked the Pacific Crest Trail back in 2007, which is where he earned his nickname. He loves long-distance hiking and is the author of “Pocket Atlas” Guidebooks and Maps. Erik is also a cartographer and blogs to share practical advice and tips about hiking, lightweight backpacking, and thru-hiking. Philip Werner is a full-time backpacker and outdoor author and lives in New England. His website SectionHiker.com is presently ranked as the #1 Hiking and Backpacking online by Adventurejunkies.com in 2018. Section Hiker was set up by Philip to highlight his thru-hiking trips on the Appalachian Trail which he has been thru-hiking section by section since 2007. He has completed 1,400 miles of the trail and has high hopes of finishing all the sections between Georgia and Maine. Philip is also a compulsive Bushwacker, day hiker, and peak bagger. Everything, to him, is nothing more than a natural exercise. What we like: We love the minimal design interface of this blog as well as the fact that the author is available to receive and respond to questions from readers. This blog is one of the most visited thru-hiking blogs on the internet today. Most of the entries on the platform are generated by hikers. More than one hundred current thru-hikers write about their adventures on this platform. 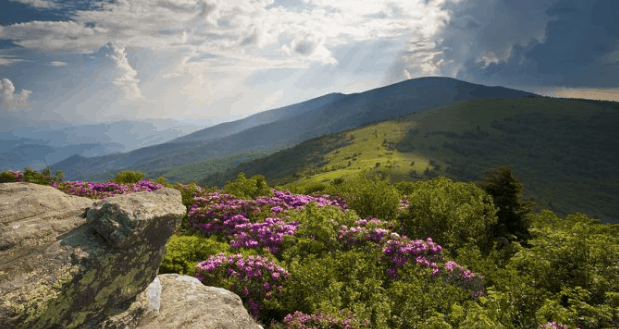 The Trek – formerly known as the Appalachian Trail – has lots of information that future hikers can benefit from as regards the type of gear to purchase, how to save a lot of money while thru-hiking, how to protect yourself from sustaining unwarranted injuries, etc. 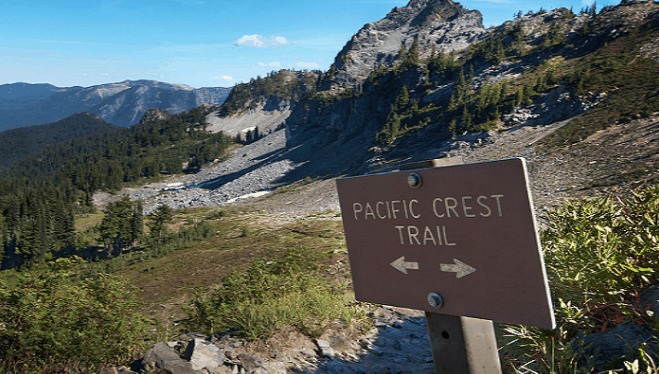 The blog also celebrates the long trails as well as long-distance backpacking of its users and is one of the go-to resources for the Pacific Crest Trail, Appalachian Trail, Continental Divide Trail, thru-hiking, etc. What we like: It is loaded with information about different aspects of the outdoors. From thru-hiking gear to news about trails and the best deals on clothing, you will get the information you need. This blog was once an online journal that recounted the preparation and hiking of the Appalachian Trail by Adam Nutting back in 2013. The author has since opened up this platform and equipped it with gear reviews, worthwhile travel, tips, and entertaining trip reports. His passion for sharing the love he has for hiking led to the creation of Epic Social Adventures with a co-founder, Scott Garvin. Nutting is also an ambassador of the Sports Chalet and Sierra Trading Post. 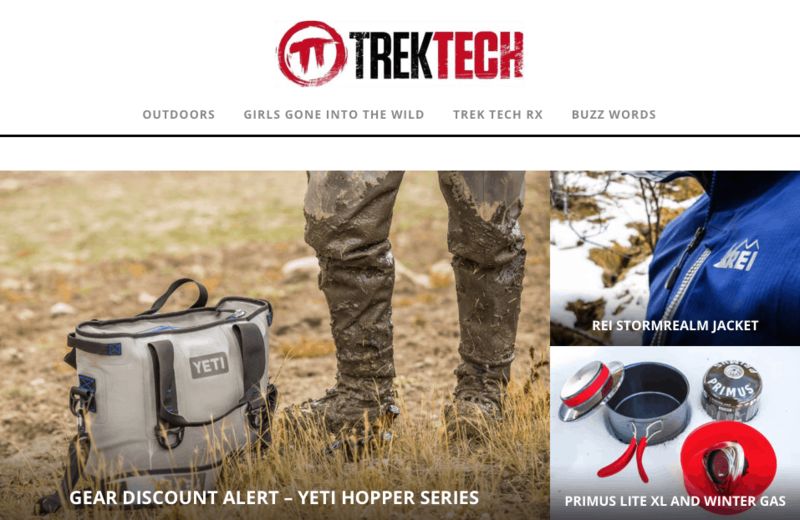 Trek Tech is your one-stop shop for all things hiking. It was initially created as a gear-assessing column for Redding Record Searchlight, a Northern California newspaper. It is now commanding a lot of attention on the web, especially in the hiking community as the blog focuses on high-quality gear while encouraging would-be thru-hikers to explore the world around them. The website also asks every visitor that land on its homepage to submit any queries they have as regards any piece of gear. This is one of the platform’s main agenda as they can provide a topnotch and unbiased review on interesting gears. They help both beginners and veteran thru-hikers to determine the difference high-quality gear and ordinary ones that don’t deserve attention. What we like: Easy navigation is guaranteed on this blog, and the high-resolution images are pleasing to the eyes. It is full of informative entries and posts about the outdoors, workouts, trail gear, etc. The author of this blog – Cam “Swami” Honan – leads a beautiful life which is a thorough combination of hiking and traveling. This platform provides lots of insight about lightweight backpacking techniques, how to plan for your trips, etc. It is one of the best hiking – and thru-hiking – platforms that boost up the wilderness skill set of its readers. You will also be regaled with lots of photographs via the numerous entries submitted and posted on the platform from some of the world’s greatest thru-hikes. All the blog does is to both inspire as well as enable would-be hikers to take the plunge into the wilderness lifestyle. What we like: We appreciate the way the author posts about lightweight backpacking techniques, and numerous advice or tips about hiking in the wilderness. 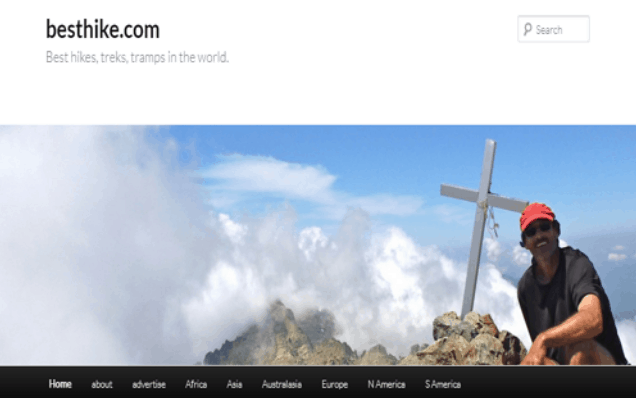 This is another blog that is thronged by hikers. It is the only national organization that works for and promotes the protection of foot trails together with their surrounding areas and the thru-hiking experience to boot. 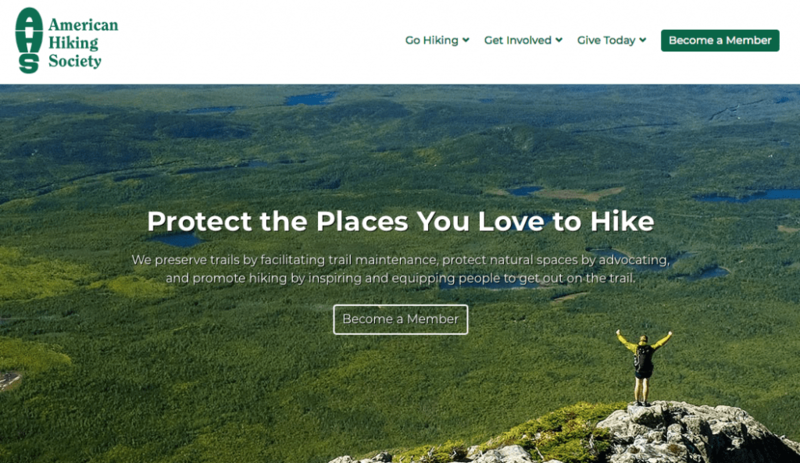 The American Hiking Society represents millions of thru-hikers who are dedicated and committed enough to preserve hiking trails and places to hike. Such people are also concerned about protecting the hiking environment for future generations. 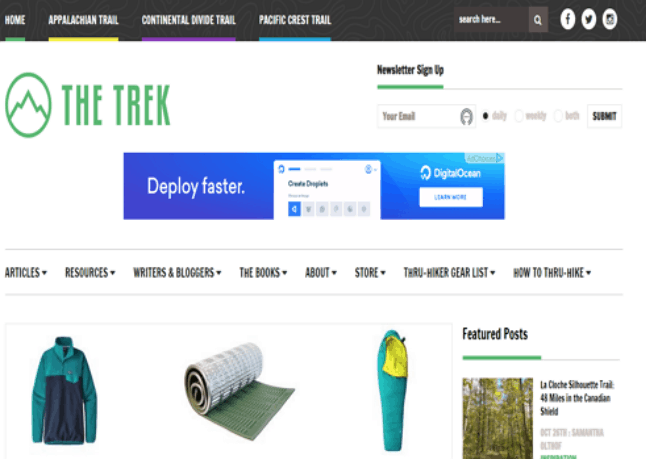 If you need lots of high-quality or reliable information on genuine gear reviews and detailed trail reports, then Modern Hiker is the place to go. The platform also showcases outdoor journalism which has been of immense help to numerous adventurers looking to explore new trails and gain more experience in the thru-hiking universe. Modern Hiker is presently one of the most-read hiking blogs along the West Coast and is known to break both regional and national news in comprehensive details and extensive coverage of its trails from Colorado to Hawaii and Mexico as well as to the Canadian Rockies. The writers that contribute entries on the platform are also seasoned outdoors people who are nearly always on a hiking mission. 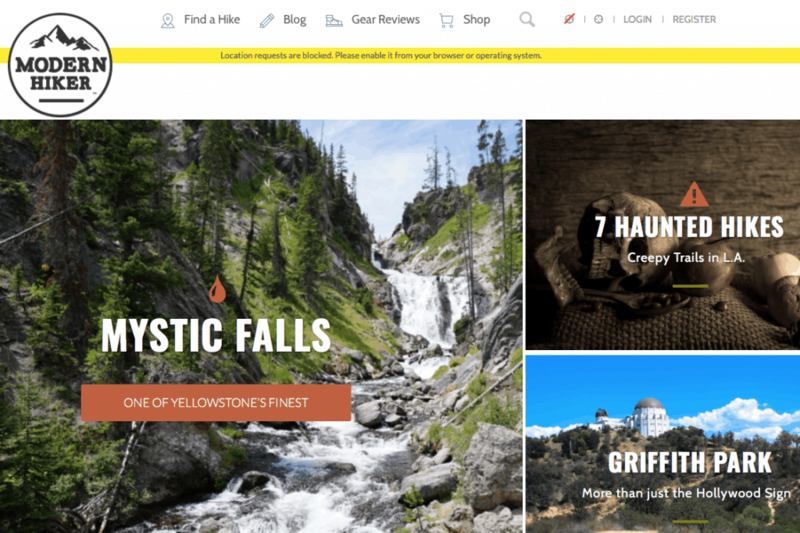 What we like: The blog is perfect with its numerous images that readers can click on to get detailed information about thru-hiking trails, Mystic Falls, hiking gear, etc. This blog is a combination of 521,000 journal entries and an incredible 1 million photographs that were captured through chronicles and experiences of over 20,000 hikers and thru-hikers alike. 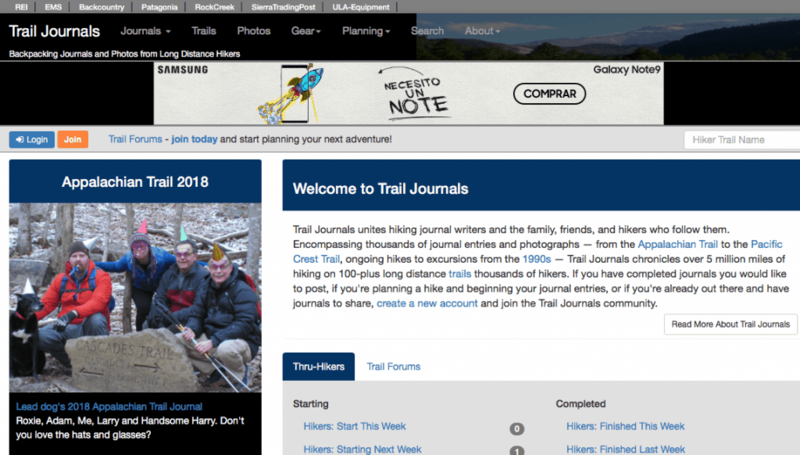 If you love reading adventurous journals and getting first-hand information about camping and its gears, then Trail Journals is your best option. 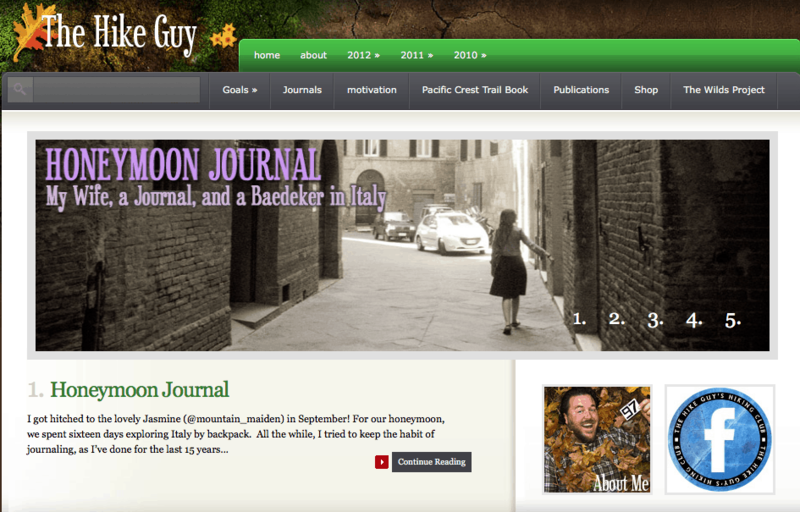 Trail Journals also has lots of reflections and insights posted by both fresh and seasoned hikers. This enables would-be thru-hikers to have an in-depth understanding of the realities of long-distance hiking and also help them to make adequate plans for their outdoor adventures. 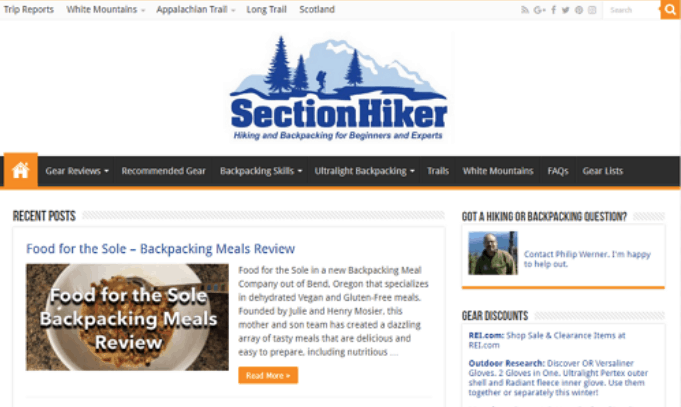 What we like: We love the way this blog works out as a social media network for hikers, backpackers, thru-hikers, etc. We also love the fact that contributors are not limited to one individual but a tight-knit community of lovers of outdoor adventure. This blog was created by a seasoned outdoors adventurer known as Michael Lanza. It offers several stories, photographs, and even trip-planning advice on notable adventures in America and around the globe. Some of this information is doable for families. The stories were inspired by Lanza and are a reflection of what he has experienced and endured by himself. 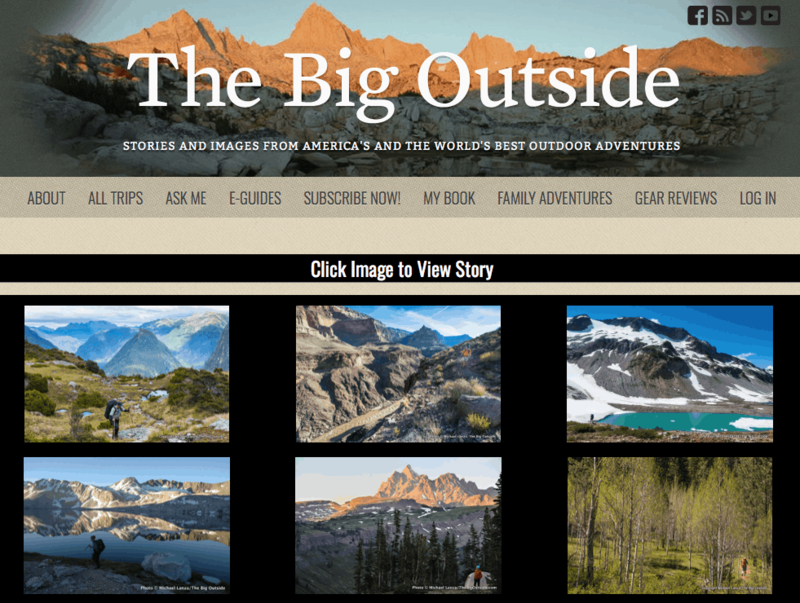 The Big Outside is also one of the leading websites that discuss the planning, identification, and writing of hiking trips. What we like: We love the fact that readers can click any of the images to read the story underneath them. 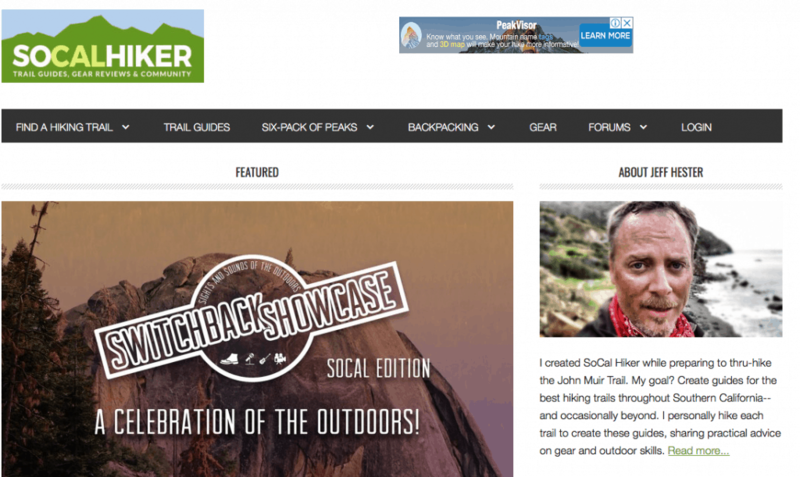 The creator was formerly a Northwest Editor at Backpacker magazine and has brought his experience to bear on this blog. Every story or entry is outlined beautifully so readers can read or be brought up to speed about the escapades of the author. If you are one of those individuals who cannot get enough of the Great Smoky Mountains, then this blog should satisfy that desire. 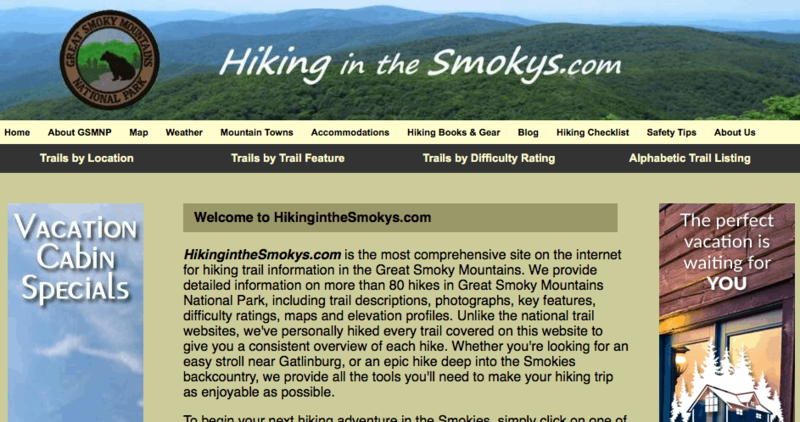 HikingintheSmokys.com is full of extensive information about the popular location and includes provisions such as the comprehensive materials and tips on over 80 hiking trails in Great Smoky Mountain National Park access to different trail descriptions together with pictures, difficulty ratings, key features, trail maps, elevation profiles, etc. The blog gets updated regularly by the addition of new trails and more substantial content. Travel information and thru-hiking tips and links to other hiking destinations are also routinely posted. What we like: The aesthetics of this blog makes it appealing to the eyes. We love the comprehensive information on the Great Smoky Mountains National Park. Every trail discussed in this blog has been hiked by the contributors. This blog is dedicated to delivering topnotch information about the best hikes out there. 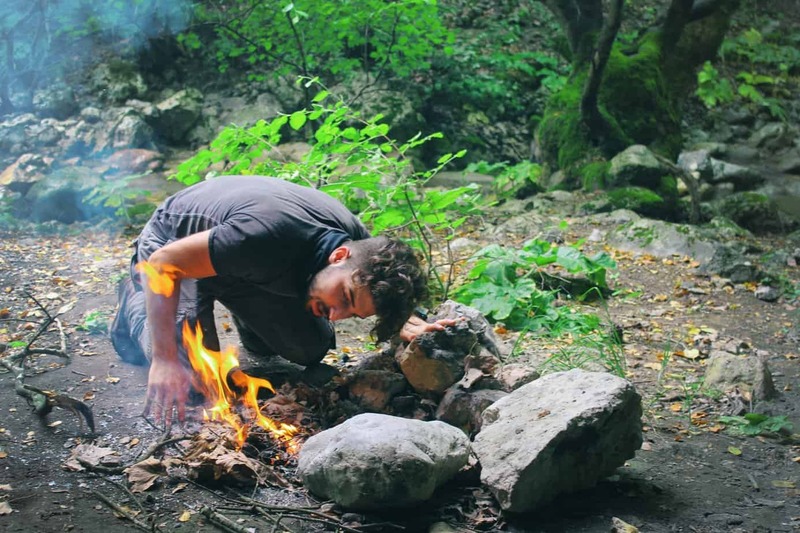 These life-changing treks, thru-hikes, and tramps are cataloged in pleasant and intimate ways. What we like: We love the minimalistic design of this blog and the simple but informative entries or posts. It is bare of annoying ads which means readers will be less distracted as they go through the stories on the blog. The Hike Guy is a website that promotes the hiking way of life via numerous examples that comes from the author’s experiences and others as well. The blog, owned by Kolby Kirk, also discusses other hobbies he is engaged in such as sketching, photography, book collection, international travel, and journaling. He is an author that lives to inspire others to live outside any boundaries. What we like: We love the in-depth information about the various thru-hiking trails and other entries about the outdoors lifestyle. Heather Balogh Rochfort is the author of Just A Colorado Girl, a blog where she highlights more than ten years of hiking adventures and other stories. Her captivating charm catapults you to numerous anecdotes on trail running, hiking, and her passion for backpacking. Just A Colorado Girl is a blog that should inspire any woman who thinks thru-hiking is not fun at all. You will enjoy Heather’s narratives since the first time she hit the trails. What we like: We love the colorful or pleasant aesthetics of this blog and the funny but informative entries by the author. Beginners and veteran thru-hikers who visit this blog can’t leave without picking one or two things about the wilderness or the outdoors in general. The goal of this blog is to allow readers to go for the best set of information they need to enhance their skills and gears in an efficient and sensible ways. What we like: We love the way each blog entry is laid out for easy navigation and perusal. This blog caters to individuals who are interested in upping their skills on hiking, thru-hiking, bushwalking, and backpacking. The goal of this site is to enhance the enjoyment of their readers while they are out there on the trails. This is evident as the blog offers different foods, clothing, gear, overland track for thru-hikers across Victoria, Australia, and New Zealand. 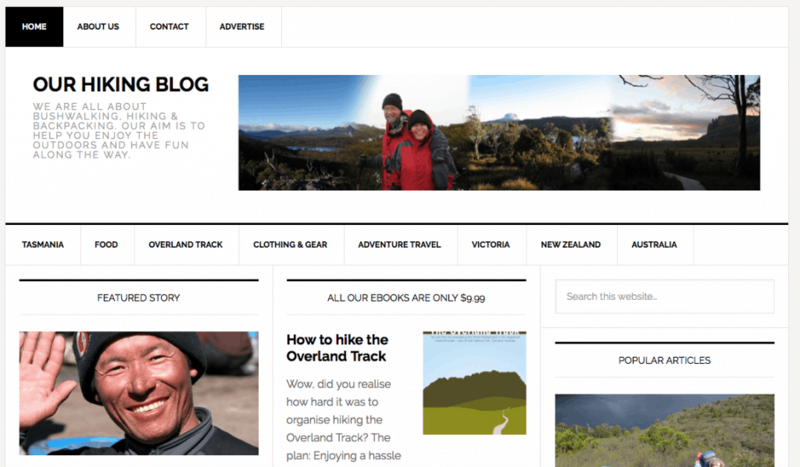 The blog is managed by an outdoors-loving couple who live in Portarlington, Victoria, Australia. What we like: We love the numerous entries from different aspects of life; thru-hiking, food, backpacking, etc. and the minimal ads on the platform are positioned strategically without interfering with the primary purpose of the visit. 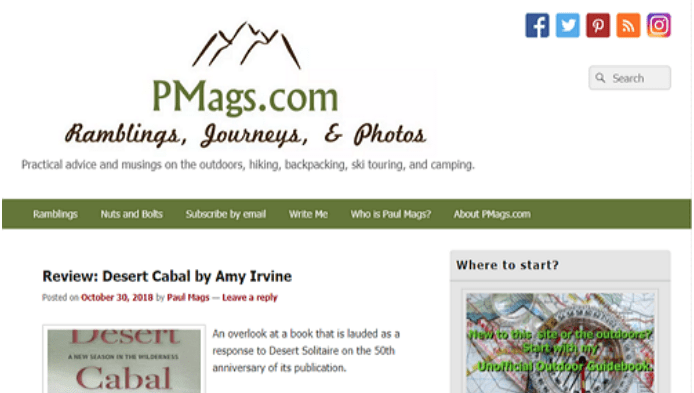 PMags is a blog that is all about all things camping, thru-hiking, lightweight backpacking, and other long-winded narratives that are interesting and full of adventurous fun. The blog is owned by Paul Magnanti and provides thoughtful and practical advice on the outdoors, backpacking, thru-hiking, and ski touring. What we like: We love the fact that each entry is clickable. The blog is minimal and easy to navigate from one page to another. Ads are almost non-existent on this informative blog. You can even get to read very old posts on previous adventures embarked on by the creator of the blog. This blog was created to fulfill a selfish service, as stated by the creator himself. However, Jeff set up this blog so that beginners can have access to guides that will showcase the best hiking trails all over Southern California, and sometimes beyond. He has personally thru-hiked each trail detailed in these hiking guides and shares practical advice on outdoor skills, the type of gear you should carry along with you, etc. What we like: We love the way each post is laid out and makes it easy to access and navigate on mobile devices. This is a blog that is set up to cater to the whims and caprices of hikers and people who plan to live out their lives on the thru-hiking trails. It covers more than 600 trails, each with its write-up that provides in-depth details about them. It is presently managed by Seth who is also an outdoors photographer. Hikers learn how to pack extra-light backpacks when hitting the trails. This is the major focus of this blog. It also provides relevant information on hiking and backpacking, and these are provided by experienced hikers. It is all about making you have an enjoyable hiking experience. These blogs have great information that you can use at any time on your next hike. Especially if you are interested in diving into the epic world of thru-hiking. They should also serve as inspiration for you to spend more time connecting with nature and soaking up the great outdoors! Let us know if you have ever completed a through-hike and which one you’d like to tackle next!